Why are we doing this? Including THIS record I mean when it’s such a throwback to an earlier time. Surely in a project that’s determined to get through to the present day – now seventy two years worth of rock releases and counting – one damn record at a time we could leave something that doesn’t quite seamlessly fit into the proceedings on the shelf so we can move on to something more suitable. But here we are reviewing it anyway. So why is that? Well, obviously the fact it’s being done by rock’s founding artist, Roy Brown, factors in. We might be a little more stringent with the qualifying markers with artists who aren’t as embedded in the landscape as Brown. Secondly it was also the designated A-side to this record, showing that DeLuxe Records had faith in it and since one of the ancillary aims around here is to tell rock’s story through the eyes of those who stood to benefit from it financially, IE. the record labels, as well as through the eyes of the artists themselves and the audiences at the time, then that makes its reasons for being included a little more substantial. But I’ll be honest, it’s neither of those, or at least neither of them was the deciding factor. What was the tipping point for reviewing this side of Brown’s latest release was the fact we get a chance – using rock’s originator no less – to show just how far the entire movement has come… by focusing on something that seemed to have been conceived as if none of the events of the past two years had ever taken place. That’s a rare opportunity for us to play the Jimmy Stewart role in It’s A Wonderful Life and see what life would be like if you, or rather if rock, had never been born. I don’t think we need to revisit the entire life story of rock ‘n’ roll again before we get Clarence the aspiring angel to work his magic to let us see the alternative path things might’ve taken, that’s what the rest of Spontaneous Lunacy and its now 465+ reviews are for. So it’ll suffice just to go back to late summer 1947 in the moments before Brown’s epochal Good Rocking Tonight was released and changed the world. We were enjoying the last vestiges of the big band era, though we might not have fully known it was rapidly coming to an end just yet, but there were certainly plenty of signs of it winding down. What nobody knew however was its vacancy wouldn’t be entirely filled by the next trend in pop music alone, that there’d instead be space carved out – and then forcibly filled – by styles originally residing on the fringe of the mainstream. Blues was about to enter its commercial heyday with the electric urban sound coming into its own and finding an audience for it that had spread geographically during the war years with transplanted Southern refugees filling Northern cities in search of work. Meanwhile country music was shedding the vestiges of its hillbilly moniker and image and increasingly coming up with songs that would be ripe for crossover appeal, either the originals themselves making inroads into the mainstream, or more likely with pop covers of those songs that at least exposed the form to middle America. Then of course there was rock ‘n’ roll which in short order would take over the whole asylum itself, rendering everything else of secondary importance when it came to market share within a few decades of flexing its muscles. You’ll notice what is absent from that breakdown of music on the rise – jazz. The very thing that had ruled the roost for so long, either directly or indirectly as the most influential musical form in America since the 1920’s. But with the demise of the big band and the failure of the more idiosyncratic be-bop to capture the nation’s ear it produced a vacuum that allowed these other styles to make their move. But the remnants of the big-band sound were still widely known after dominating the landscape for a decade or more that it’s not hard to discern what a record label’s aims were any time you heard a massed horn chart kicking off a record, the higher range brass boldly out in front, nobody playing anything ostentatious or trying to draw attention by stepping outside the others for an early ear-blasting solo. A throwback to a recent time when bandleaders ruled the roost, where musicians sat shoulder to shoulder playing carefully worked out charts with little or no room for improvisation… and no tolerance for such insubordination if they had the notion to try. It was the sound of the early to mid-1940’s, when World War Two was far from decided, when new automobiles had stopped rolling off the production line and old autos were up on blocks in the driveway, unable to be driven thanks to wartime rationing of gas, oil and tires. Every house on every block had someone off in another part of the world, either fighting the Axis Powers or working in a distant factory to help the war effort. In their spare time they gathered in canteens and clubs, dancing to music coming from these full brass sections playing decidedly blue sentiments that fit the mood of the nation. 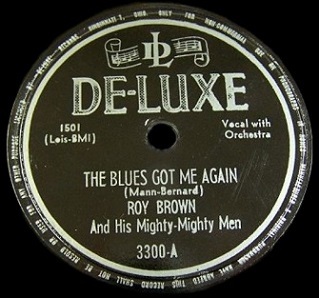 Now with with the aptly titled The Blues Got Me Again, Roy Brown tries dragging us back six years to revisit that time once more. It’s hard to imagine what he was thinking in tackling this. Oh, the subject of the song itself doesn’t implicitly refer to any past events and let’s face it, being despondent is hardly confined to moments of international crisis and despair, but rather the question is why he chose to present those feelings wrapped in a musical motif that was so outdated. We can’t ask him obviously, but we can probably make some educated guesses as to his thinking on the subject. Usually we’d tend to blame the record company for having more faith in proven stylistic precedents than in untested visionary gambits, but this is SO hoary in its touchstones that we can probably dismiss that idea out of hand. Besides, Syd Nathan, who’d taken control of the DeLuxe label to get his grubby mitts on the forward thinking Brown to begin with, certainly had plenty of positive returns from his stable of rock artists by now to trust that it was a bankable sound and therefore he didn’t need to reach so far back to find something marketable. It could be that Henry Glover, ex-trumpet player in Lucky Millinder’s outfit, one of the foremost aggregations of the early 1940’s big band scene, had an affinity for the style he knew firsthand so well and prompted them into playing it. But that makes little sense at this point too, since Glover had shown great foresight in his arrangements for other artists who were defining much of rock in the late 1940’s. So what is the likely reason for this bewildering decision to turn back the clock so far? How about the most obvious one of all – Roy Brown himself. Yes, we know that Brown basically invented rock ‘n’ roll and was now reaping the rewards of his creation with a string of monster hits, sold out shows and a reputation second to none. But keep in mind he’d grown up in a time when THIS sound ruled the airwaves and wasn’t considered old fashioned then, but rather it was cutting edge for its time… a time when Brown was just starting out on his own having lost his mother while still in his middle teens and so for him the sounds of the big band horns might’ve been a comforting reminder of a period in his life when things were much simpler than they’d become while leading the life of a major rock star. It also needs to be pointed out that his stellar band, The Mighty Mighty Men, who very well may have been the best self-contained touring rock ‘n’ roll outfit of the 1940’s (we’re not quite sure The Hep-Cats, their only real competitors, went on the road extensively) had all come of age during the same time themselves. While they excelled at playing boisterous rock it’s certainly possible that a few of them might have preferred listening to something a little more sedate in their spare time. That’s the thing we’re always going to have to remember when it comes to ALL rock artists over the years. No matter when somebody becomes a star their own period of first being swayed by music will have generally occurred eight to twelve years earlier. Though obviously they can’t revert back to the sounds of their youth if they want to make it in the current landscape that doesn’t mean when that once they’ve established themselves they won’t want to occasionally indulge in revisiting those dormant musical memories. And so it is with The Blues Got Me Again, a song which pairs the sonic template of yesteryear with a lyrical framework more suited to this day and age when Roy Brown was the king of rock ‘n’ roll. Trumpet and piano jerk you back into the past in a way that’s startling enough to give you whiplash, especially if you’ve just gotten done listening to the rawest slice of rock ‘n’ roll mania Brown’s yet delivered on Boogie At Midnight which adorns the other side of this single. That intro finally makes room for Batman Rankins tenor sax which at least helps take off some of the harsher vibes it’s producing, but he too is kept straitjacketed for the most part as they are bound and determined to sound as mournful as possible to frame Brown’s haunted sermon. We know there’s nothing archaic about Roy’s voice at least, which still retains all of its emotional nuances, effortlessly swelling power and light touch no matter what material he’s delivering nowadays. His approach to The Blues Has Got Me doesn’t quite fit with the band’s approach, at least early on, and had he “goosed up” something so maudlin a decade earlier he’d have likely been thrown off the bandstand for his impudence. But not today where that and that alone is what keeps this from descending into complete irrelevance. But even here it’s not necessarily a great performance as much as it is merely a more appropriate for the time we find ourselves in. If you were a rock fan who bought this record however you’d have no idea what to make of it, whether it was something dragged out of mothballs to affix to the flip side of perhaps his best single to date, or if it this abrupt U-turn was signaling a new direction in his music. His misery which saturates the grooves at least has a familiar theme, that of a girl about to up and leave him (I’m guessing because he wouldn’t stop dragging out his old dusty record collection, but what do I know?). The thing about it is what he’s saying doesn’t always fit what he’s suggesting by how he sings it. When he tells her he won’t beg her to stay he does so in a voice that is the textbook definition of pleading. So much for honesty… Who knows, maybe that’s why she’s walking out. Thankfully the solo that breaks up this dirge is taken by Rankins, but it’s a listless performance, one I’m sure he felt fit the mood Roy had been setting, but which does us no favors. Even if we were more amenable to the retro-stylistic approach of The Blues Has Got Me we’d be far less forgiving for the way it doesn’t really connect on those terms in a powerful way either. Brown’s declarations themselves are full of self-pity which gives him no redeeming qualities to offer us and get us on his side. His girl remains quiet, obviously she’s not singing on this, but nor is he conveying many of her reasons for leaving, which means we’re going to be making guesses based solely on his attitude and in that case we can hardly blame her. The band may never quite revert back to the days when FDR was in the White House after that garish intro but they aren’t far from it either, as the piano takes the lead for much of this without any strength in its convictions, lightly tinkling the ivories ineffectually rather than pounding out an insistent defense for Brown’s actions – or inactions as it were – that caused his girl to want to find somebody else. But then again you can hardly blame any of them for being so passive in their jobs here. They’ve been given a song that has no chance at stirring any excitement, saddled with an arrangement that is so sickly as to be on life support and are faced watching their leader curl up in the fetal position, balling his eyes out, unable to stand up and take control of the situation, be it the situation in the story or in the studio. We’ll be generous and call this one an indulgence he’d earned from previous successes and just be grateful that IT didn’t find any takers on its own, forcing us to relive the 1940’s from the start with Roy Brown once we got into the 1950’s. It’s not that the early 1940’s weren’t musically rewarding in their own right, but their time had passed, a new national mood had long since taken hold and as such a new outlook was needed for the generation coming of age now. They’d gotten it too, thanks in large part to Brown himself, and so hearing him of all people looking back so wholeheartedly at something they’d all presumably left behind was rather disconcerting. We’ll try not to overreact and sound the alarms provided he kept this sort of thing to a minimum. After all there are two sides to every single and as long as he kept giving us the storming rockers like the one on the flip side to placate us we’ll let him have these occasional forays into the hazy past… but that doesn’t mean we have to say anything nice about it in the process. Leave a reply on "Roy Brown: “The Blues Got Me Again”"